In This article we will learn how we can search test cases for a test project in Test Link. As we know, Test link is used for Test cases management. A user can create Test cases as per the different scenarios in project so it is normal that test case value is increase day by day. You will find difficulty when you want to verify only one or two test case among created all. Test link also give you the facility to create keyword for find group of test cases or group of test suits. Test cases are placed under different test suit. 'Search Test cases' is the screen from where you can find your created test cases. If your search criteria is not match with any result then Test Link will display you the message like no test case is found beyond your search criteria. You need to search test cases on confirm terms and condition if your created date is different and you are entering different on screen then you will not get proper result. Test Importance, Status, Summary, Preconditions, Created By, Edited By, Created Date From, Created Date To, Modified Date From, Modified date To , Document ID. You have to enter at least one filed to find a test case. Test Link will provide you the result as per your select criteria for Test case. For Example , You have enter Test case Importance as 'High' and selects date as 04/05/2015 then test link will display you the test cases which have High priority and created on 04/05/2015. One more thing is happen here if you search criteria have more result of test cases then it will display a message as 'Too Many Data are found , kindly modified your search criteria'. It means you need to select more specified criteria for searching test cases. 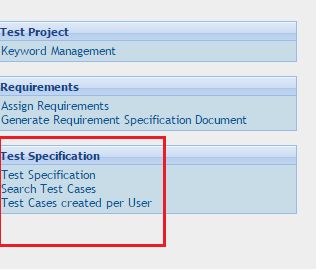 We can take an example just as above , before we have searched Test Importance and Date now if we get the message then we need to select another criteria with Test Importance and Date, now we will select Project Version , Project Status so more specific criteria will give us proper result. Here you need to click on 'Find' button. Then related test cases will be displayed on the screen and you can review it. Once you get result for test cases, you can expand and collapse the group of test cases on this screen and if you want to edit filters then this facility is also given in Test Link. Test cases will be displayed with Test suit name. Thus, you can identify Test suit also by searching Test case. First of all you need to log in with Test Link. Then select Test Project. As you will navigate on home page you will able to see the 'Test specification' Tab from where you need to click on ' Search Test Cases' Button. This is the image of home page from where you can select 'Search Test Case' button. Click on it. This is the screen for searching test cases in Test Link. As I have define before you will get different fields for enter your criteria here. Enter your search criteria here and click on Find Button. Here we have selected Test Importance and Status, Then after clicking on find button, application is displayed a message as 'Too many result. Please set more specific criteria for search”. Thus we have selected another filter as Expected Result = 'Pass' and then click on 'Find' button. Here you get your respected result of Test cases. You can verify it on Image. Here Data is not that much for our search criteria, but if more data will be there then test link will collapse date as per Test suit. Once you Collapse all data you will get a date and time for your search procedure. This is all about Search Test cases in Test Link.